Relays are used to separate electrical circuits and to switch electrical consumers up to a current of 70 amperes. The advantages of relays are the compact design and the possibility of switching large electrical consumers with low currents. Furthermore, relays provide the possibility of switching higher voltages with low control voltages. In a robust plastic housing, is an electric solenoid coil, which is supplied with electricity via a standard flat plug when switched on. When electricity flows, the coil produces a magnetic field in the core of the coil which, via an armature, opens or closes one or more contacts, depending on the design. To obtain a low tendency to “sweating” and low contact resistance, the plug contacts are made of brass with a nickel-plated surface and the switching contacts are coated with resistant silver-tin oxide. 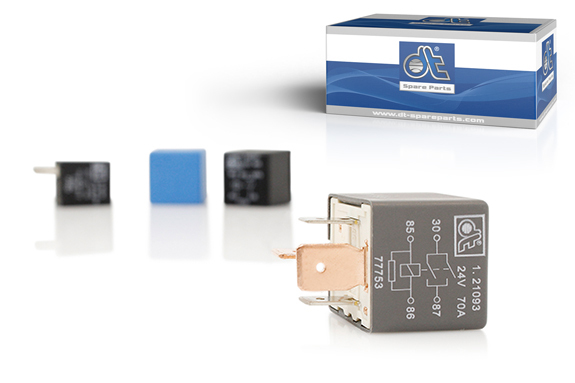 To prevent the occurrence of contact-braking sparking, relays with double contacts are available, depending on the application. Relays of the brand DT® Spare Parts often already contain electrical components in the housing to restrict the counter-induction voltage of the coil. This prevents the circuits from interacting with each other, which can lead to unwanted relay switching.